ANALOG—The processing of data by continuously variable values. ANGLE—A figure formed by two lines or planes extending from, or diverging at, the same point. APEX—The highest point or peak. drawing of the assembly or adjacent subassembly. ARC—A portion of the circumference of a circle. used to show features not visible in the normal projections. AXIS—The center line running lengthwise through a screw. rotated at an angle, so that more than one side is seen. and lower chords at the points of contact. Bar joists are used as floor and roof supports. with strings as a guide to elevation and to outline a proposed building. measuring the elevation or location of other points. BEND ALLOWANCE—An additional amount of metal used in a bend in metal fabrication. BILL OF MATERIAL—A list of standard parts or raw materials needed to fabricate an item. BISECT—To divide into two equal parts. are represented by squares, rectangles, or other geometric figures, and the normal order of progression of a signal or current flow is represented by lines. to be blue, modern reproduction techniques now permit printing of black-on-white as well as colors. BORDER LINES—Dark lines defining the inside edge of the margin on a drawing. BREAK LINES—Lines to reduce the graphic size of an object, generally to conserve paper space. CANTILEVER—A horizontal structural member supported only by one end. CAST—A metal object made by pouring melted metal into a mold. alternate long and short dashes evenly spaced. members. The top chords serve as roof rafters. The bottom chords act as ceiling joists. CIRCUMFERENCE—The length of a line that forms a circle. pin. It provides a hinging effect for flexibility in one plane. media from a computer to produce machined parts. guide a machine that produces parts. CONE—A solid figure that tapers uniformly from a circular base to a point. CONSTRUCTION LINES—Lightly drawn lines used in the preliminary layout of a drawing. CORNER POSTS—Vertical members located at the corners of a timber structure. CORNICE—The projecting or overhanging structural section of a roof. minor diameter of an internal thread. CUBE—Rectangular solid figure in which all six faces are square. 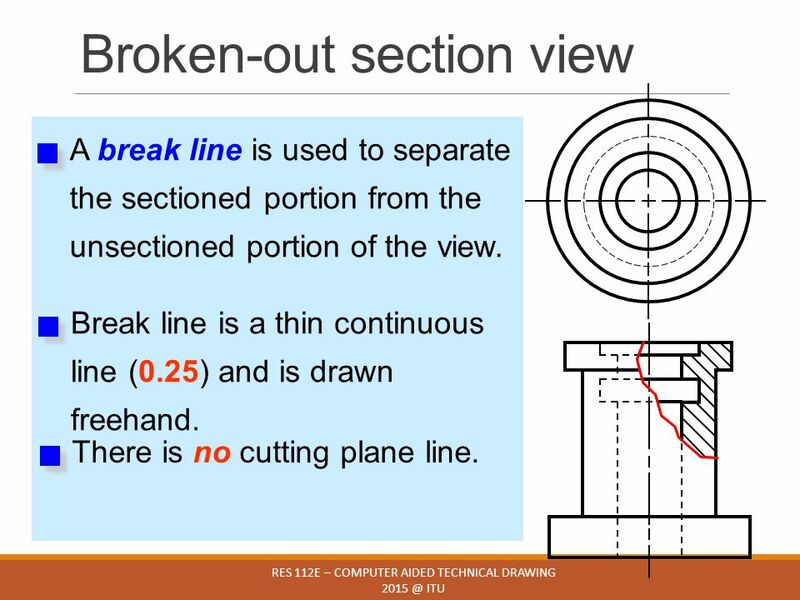 CUTTING PLANE LINE—A line indicating a plane or planes from which a sectional view is taken. CYLINDER—A solid figure with two equal circular bases. permanently attached equipment, used in designing a building and its foundations. DEPTH—The distance from the root of a thread to the crest, measured perpendicularly to the axis. DIGITAL—The processing of data by numerical or discrete units. terminating with an arrowhead; used to define the dimensions of an object. DRAWING NUMBER—An identifying number assigned to a drawing or a series of drawings. DRAWINGS—The original graphic design from which a blueprint may be made; also called plans. interchangeably with schematic diagram, especially for a simplified schematic diagram. 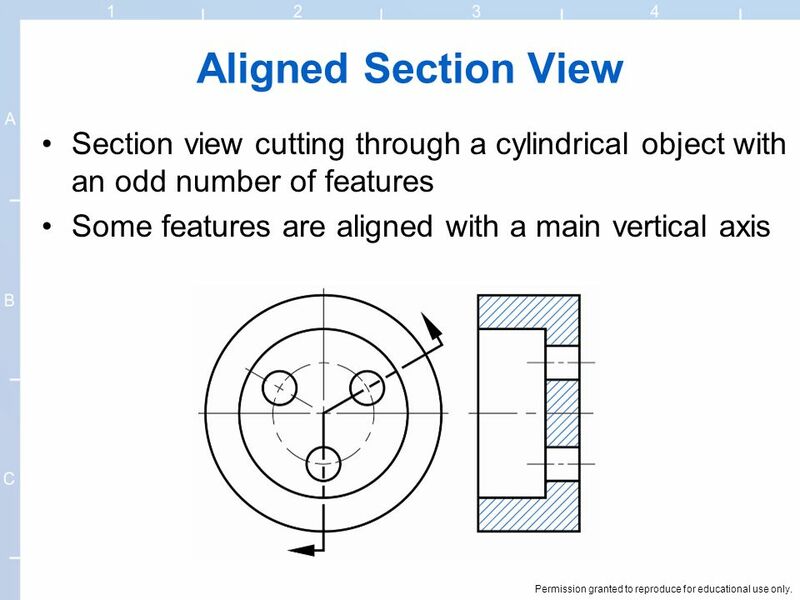 view can be particularly helpful in assembling complex objects. EXTERNAL THREAD—A thread on the outside of a member. For example, the thread of a bolt. FILLET—A concave internal corner of a metal component. FORMAT—The general makeup or style of a drawing. FRENCH CURVE—An instrument used to draw smooth irregular curves. FULL SECTION—A sectional view that passes entirely through the object. to support other structural members at isolated points along its length. define the kind or type of material the section surface consists of. cylinder with a forward progression. INTERNAL THREAD—A thread on the inside of a member. For example, the thread inside a nut. ISOMETRIC DRAWING—A type of pictorial drawing. 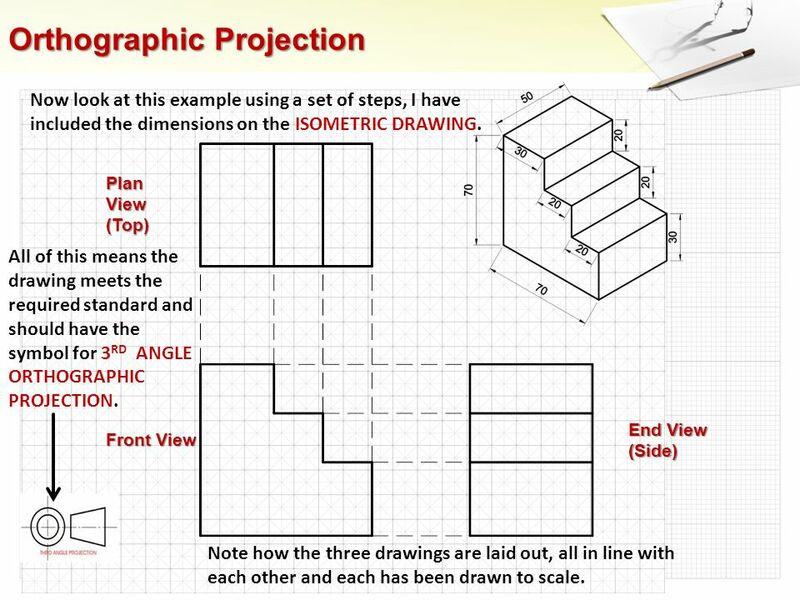 See ISOMETRIC PROJECTION. any two of them are 120 degrees. structure, and the location of equipment such as panels and connection boxes and cable runs. to support a ceiling, roof, or floor. KEYSEAT—A slot or groove into which the key fits. the pitch; on a triple-thread screw the lead is three times the pitch. above a window or door opening, and is also known as a header. perform a logic or information processing function. MAJOR DIAMETER—The largest diameter of an internal or external thread. design work purchased by the United States Armed Forces. MINOR DIAMETER—The smallest diameter of an internal or external thread. NOTES—Descriptive writing on a drawing to give verbal instructions or additional information. object illustrated. Vertical lines in the view may not have the same scale as horizontal lines. lie in the same plane. each projection plane parallel to one of the coordinate axes of the object. the internal structure of a small portion of an object, also known as a broken section. PERPENDICULAR—The line or view from an object at 90 degrees. PHANTOM LINES—Lines showing the alternate position of a movable object. location, function, and appearance of parts and assemblies. system and the electrical wiring between the parts. PIER—A vertical support for a building or structure, usually designed to hold substantial loads. PILASTERS—Columns built within a wall, usually projecting beyond the wall. PILLAR—A high-strength vertical structural member. measured parallel to the axis. PLAN VIEW—A view of an object or area as it would appear from directly above. PLANE—A longitudinal section through the axis of an object. with the elevations and the grading requirements. POLARITY—The direction of magnetism or direction of flow of current. drawing of a solid object. RADIUS—A straight line from the center of a circle or sphere to its circumference or surface. RAFTER—The horizontal or inclined members that provide support to a roof. RAFTER PLATES—Horizontal members that support the wall ends of rafters. and electronic drawings, diagrams, parts lists. more detail or other information. REMOVED SECTION—A special view to illustrate a particular cross section of an object. record any changes made to the original print. also known as a ridgepole. diameter of an external thread and the major diameter of an internal thread. actual object. Also a measuring device, such as a ruler, having special graduations. observed in conventional outside views. section or plane is viewed or taken. support systems, and concealed features of a structure. equipment needed to operate and maintain a ship, also known as onboard plans. components in a circuit or system. significant physical features on or near the construction site. SOLEPLATE—A horizontal structural member used as a base for studs or columns. manufactured, assembled, and maintained according to their performance requirements. the column or wall they support; used to distribute the load of a column or wall to the subgrade. component such as an airframe or a ship’s hull. SUPERSTRUCTURE—The part of a bridge above the beam seats or the spring line of an arch. SYMBOL—A graphical representation of the component or part shown in a drawing. identify the part or assembly. TOLERANCE—The amount that a manufactured part may vary from its specified size. TOP PLATE—A horizontal member at the top of an outer building wall; used to support a rafter. rises and remains constant once it is complete. traffic, the structure happens to be supporting at a particular instant. geometrical constructions to translate dimensions from the drawing to the pattern. over a specific maximum span. units, that forms a rigid framework for supporting loads over a span. VERTEX—A corner or a point where lines meet. VIEW—A drawing of a side or plane of an object as seen from one point. the wiring, connectors, terminal boards, and electrical or electronic components of the circuit. point or part on the map.